Do you know how many times we followed said schedule? Exactly none. I had these great visions of proving my parental prowess, and failed miserably. You know the area in which I excelled? 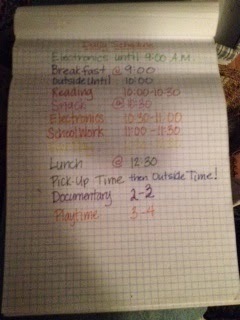 Letting my kids have free rein over their day. There were several that I didn’t even have to make breakfast…we had brunch instead. That’s one less set of dishes, my friends. By this time last summer, I’d written our letter to the teacher. It’s a good one. You can read that here. This summer, I’m wondering if I even need the letter. Big Brudder has changed and grown to a point that has me beyond pleased. Is he “typical” ? No, but more often than not, I feel like “he’s got this.” The NT (neurotypical) Wee One is going into big kid school; I honestly feel like he needs a letter to the teacher more than BB. He’s definitely more challenging at the moment. His apple doesn’t fall far from the maternal tree, bless his heart. Maybe this year instead of letters, I’ll give those tiny little liquor bottles and gift certificates for a massage. I’m ready for routine. I’m ready for my boys to miss each other at the end of the day. I’m ready to miss my boys at the end of the day. I’m ready to clean my house (did I jsut say that?) and to be able to enjoy the clean for a couple of hours. I’m ready to rock this school year like the awesome helicopter mama bear (did you know bears fly helicopters? They totally do!) I am.